Nick Galbreath (@NGalbreath) has published the great presentation he delivered at OWASP's AppSec USA last week. 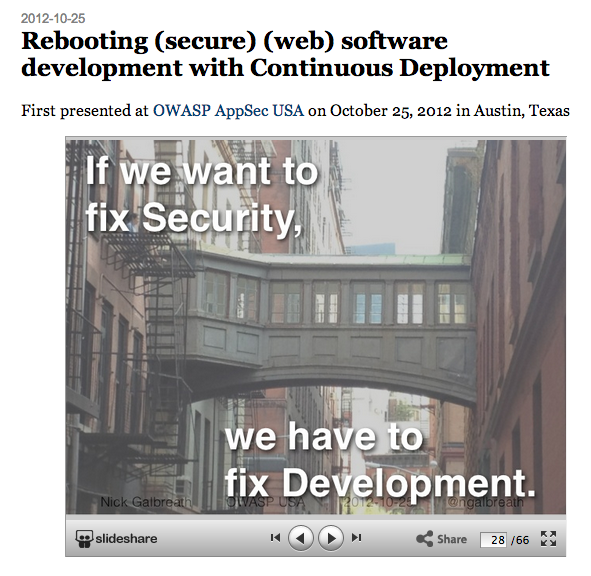 "If we want to fix Security .... we have to fix Development"
One of the reasons why driving security changes and making code-fixes is so hard, is because security doesn't live in isolation and it is 100% depended on the development process that exists on the other side. .... I can just hear the developers calling the security teams and say "....Hey we want to change how we develop our applications/websites, can't you come over and tell us what to do? ... Since you've been trying to 'tell us what to do' forever ... you must have good solutions for how to create the type of Development environment that Nick is talking about'..."
Why should a developer care about security training? 1.The product has a defect...Did you check witht the developer? 2.The product does not have a good performance... Did you check with the developer? 3.The application does not work.... Did you check with the developer? And it would be great that all the software developers had the same knowledge than a Security expert, but not always is the case. If all the teams had a security expert (someone that can provide guidance and best practices about security)it would make the software more secure. I have been quite observer about this topic. And this is one of the reasons why I want to present in our OWASP Day about how important is that all the people involved in the development of applications works together and take the security a bit more seriously. We need to learn from the past. Yap and the more us (the 'security experts') can help (and add value) to developers the more they will want us to be involved. But also very important is for the 'security experts' to realize that they might be 'experts' in security, but are usually not 'experts' in development.